A James-Beard-award winning chef opens an Italian spot in the Spheres, and a hot new ramen spot on Capitol Hill draws long lines. But Bellevue has a new restaurant that may be even bigger news. Menya Musashi Niten Ichiryu, the latest ramen house on Capitol Hill, debuted in November with a wait that was just as long as Shake Shack’s, winding at least two blocks along Belmont Avenue on Capitol Hill. 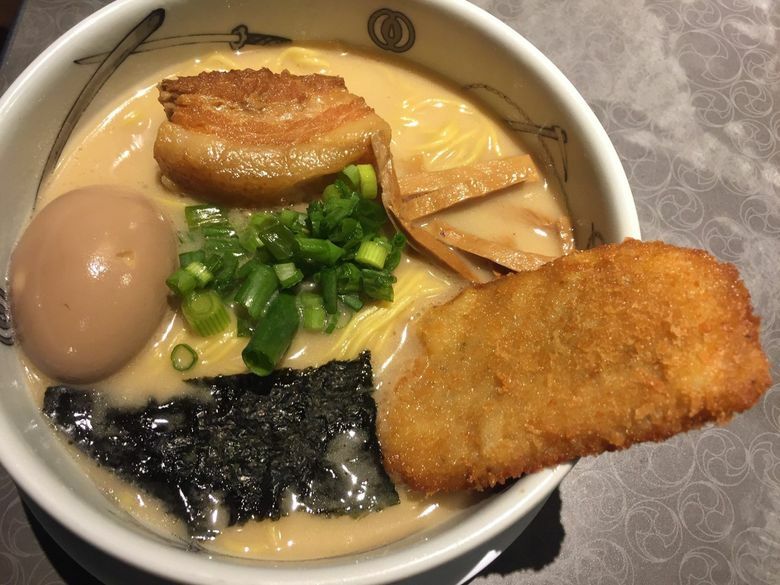 Menya, which has 14 locations in Japan, also opened a branch in Los Angeles this summer; Seattle is its second location in North America. Especially popular is the Musashi bowl, a rich pork-and-seafood broth with braised pork belly, pork katsu, boiled egg and noodles. And Menya’s juicy gyoza dumplings are some of the best on Capitol Hill. James Beard Award-winning chef Renee Erickson has opened an Italian restaurant, Willmott’s Ghost, inside the Spheres, which is open from morning until late. Starting at 8 a.m., sweets such as olive-oil cake and biscotti are served, as well as espresso drinks. For the Amazon lunch rush, there are pizzas and panini such as a porchetta sandwich. By evening Willmott’s Ghost does table service: Diners can order fritti (a variety of fried noshes) along with Roman-style pizzas, steak and chicken entrees. The Los Angeles-based bistro The Hart and the Hunter expands to downtown Seattle inside the Palihotel, with a focus on Southern dishes such as hot chicken sandwich and blackened shrimp grits. Its signature butter biscuits — served with a spread of jam, maple butter and pimento cheese — are as good as advertised. The aesthetic is, um, distinctive. Painted in a pale moss green with chrome stools, checkerboard floor, weathered beams and lathes artfully exposed to show off the plaster, the bright space reminded me of an Eastern seashore diner as imagined in a Gene Kelly musical. I half-expected the servers to break out in a song-and-dance number. The owner of Kells Irish Brewery and Restaurant in Portland opened Coltiva Pizzeria e Barra in Lower Queen Anne with pizzas, salads and lasagnas. Drinks focus on amari and aperitivos. On Beacon Hill, Corte Fino Mexican Cuisine does halal Mexican food. The early word is that the horchata may be the best in town. Ma’ono hawks its popular chicken sandwiches at a counter window inside Rachel’s Ginger Beer on 12th Avenue. Nearby is the tea spot Atulea. By Tae, a hand-roll and sushi pop-up, now has a counter space inside Chophouse Row. Noren on Capitol Hill is a sushi restaurant that seems to be taking The Cheesecake Factory approach to its food offerings. There’s something here for everybody: burgers, seafood pasta, shrimp po boys, fish and chips, chicken Parmesan and Buffalo wings. The menu also features monkey brain, which, mercifully, is just hamachi and prosciutto. Also new to Capitol Hill are the vegan bakery Cinnaholic and, along 15th Avenue East, the Thai spot Bites of Bangkok. Nana’s Green Tea brings its signature matcha and Japanese snacks and desserts to Denny Triangle for the Amazon masses. Bopbox, a new spot in Georgetown, does bulgogi, kimchee pancakes and other Korean comfort food. Seoul Zip in Belltown serves bulgogi three ways: as a burrito, sandwich or rice bowl. Premier Meat Pies along Pier 54 on the Seattle waterfront features about 10 savory-pie options, from shepherd’s pie to Hatch chile chicken pie. Lowrider Baking Company, a fixture at Seattle-area farmers markets, now has a home at the Georgetown Trailer Park Mall, according to Seattle Met. In Madison Park, Hanok focuses on bibimbap and other Korean comfort food, along with a few Japanese dishes. The Block opened on the Ave in the University District, serving rice bowls, tofu soups, fried rice, teriyaki and curry dishes. Nearby, Kitanda opened another acai-bowl spot. New food truck Sugar + Spoon sells safe-to-eat cookie dough, as well as ice cream. The Dolar Shop is Bellevue’s big opening, a swanky hot-pot chain at The Shops at The Bravern. Dolar operates 52 branches in North America, Europe, Asia and the Middle East. The buzz has been unreal, with a dinner wait on weekends that’s about two hours. Last week, customers started lining up at 11 a.m. for the 11:30 a.m. opening. Also in Bellevue is Núodle, which specializes in hand-pulled beef noodle soup. Three more bubble tea/Asian dessert spots are new to Bellevue: Kung Fu Tea, Chatime and Mr. Wish. In Kenmore, Seaplane Kitchen & Bar comes with an impressive pedigree — it has the same investors as Bastille Cafe & Bar and Stoneburner in Ballard and Rhein Haus and Poquitos on Capitol Hill. Talented barman Erik Carlson of Stoneburner did the cocktail menu and chef Jason Stoneburner put together the menu of pizzas and shared plates. Issaquah is the location of Ivar’s Restaurants’ 22nd branch, in the former Pallino space.